I mentioned in a post a few weeks ago that I live in a house surrounded by people and animals who build things. Not to be outdone, my front yard is getting into the mix. Although we initially thought it was only another growth of leaves, it seems our agave is actually growing a massive flower stem. Also called "century plants" because they bloom so infrequently, this stalk may grow as high as 40 feet. In other words, the Hightower home is going to have a high tower in its front yard very soon. 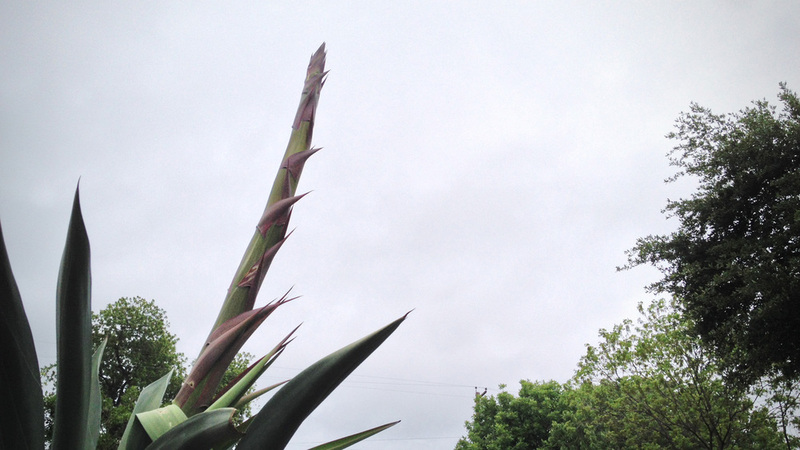 Our agave has been on growth-spurt these last few years and has frankly grown to monstrous proportions. Even without it's most recent addition, the plant was over seven feet tall and was known to occasionally attack cars and small children. Given its rapid rate of growth we were beginning to wonder if we were going to have to abandon the sidewalk leading to our front door and eventually our house as well. This will not be necessary, however, as the original agave plant dies shortly after reaching full bloom. Until then, we're in for quite a show.